These Odds & Ends Table Decor are great little scraps of yarn busting projects. Use up your leftover yarn to make your next party or gathering unique and fun! January is usually that time of year when you feel completely deflated yet excited about the New Year. Your stash is most likely also deflated after the festive holiday gift making – leaving you with loads (I am sure} of bits of yarn, left overs and odd sized yarn balls. Right? These projects are just perfect for using up those leftovers! Plus isn’t it always fun to make cute stuff you can display AND use? Perfectly fun, retro, bohemian table decor that is sure to make any party, gathering or even a family meal chic! Cotton – or any yarn! Completely your choice!! 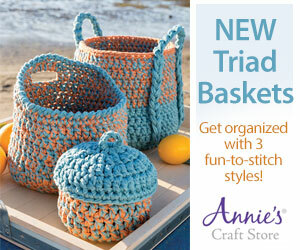 Have fun and make these in assorted leftover cotton yarn colors! RND 1: CH 3 (counts as 1 DC); work 11 DC into ring (12 DC); SL ST into 3rd CH of 3 CH. (24 DC and 12 x 1 CH spaces); SL ST into 3rd of 4 CH. *work [1 DC; 1 CH; 1 DC] into NEXT 1 CH space. (24 DC; 12 x 1 CH spaces); SL ST into 3rd CH of 4 CH. work 1 DC in-between the next 2 DC of RND 2; CH 1. Repeat from * 10 more times. (36 DC); SL ST into 3rd of 4 CH. work 1 FPDC around next DC. *Work [1 DC; 1 CH; 1 DC] into NEXT 1 CH space; work 1 FPDC around next DC. (24 DC; 12 FPDC); SL ST into 3rd CH of 4 CH. work 1 SC into each DC and 1 CH space. (48 SC); SL ST into first SC worked. RND 7: [CH 9; SKIP NEXT 5 SC; SL ST into next SC] x 8; SL ST into the SC at the start of this round. work 10 DC into same space; SL ST into same space. *Work SL ST into next space; work 10 DC into same space; SL ST into same space. work [3 DC; CH2] into ring 3 more times. SL ST into 3rd CH of 3 CH. work 1 FPDC around next DC; CH 1; SKIP next DC; work 1 FPDC around next DC. Repeat from * 2 more times. SL ST into 3rd of 3 CH. work 1 DC into each DC and 1 CH spaces until next corner. CH 3 (counts as 1 DC); work 4DCtog into same space; SKIP next DC; SL ST into next 13 DC; SKIP next DC. *Work 5DCtog (popcorn) into next 2 CH corner space; SKIP next DC; SL ST into next 13 DC; SKIP next DC. Repeat from * 2 more times. SL ST into top of 4DCtog. work [2 DC; CH 1] 5 more times into ring. SL ST into 3rd of 3 CH. Repeat from * 4 more times. (24 TR) SL ST into 4th CH of 4 CH. *work 3 TR into next 1 CH space. Repeat from * 10 more times. Crochet some flowers; Cut flower shapes out of card; Sew on flower buttons to center of crochet flower; glue crochet flower onto card; glue the card onto a Popsicle stick!